Full color, new shapes and maxi formats is Tonalite’s watermark. As always with Tonalite, colour is the key player. 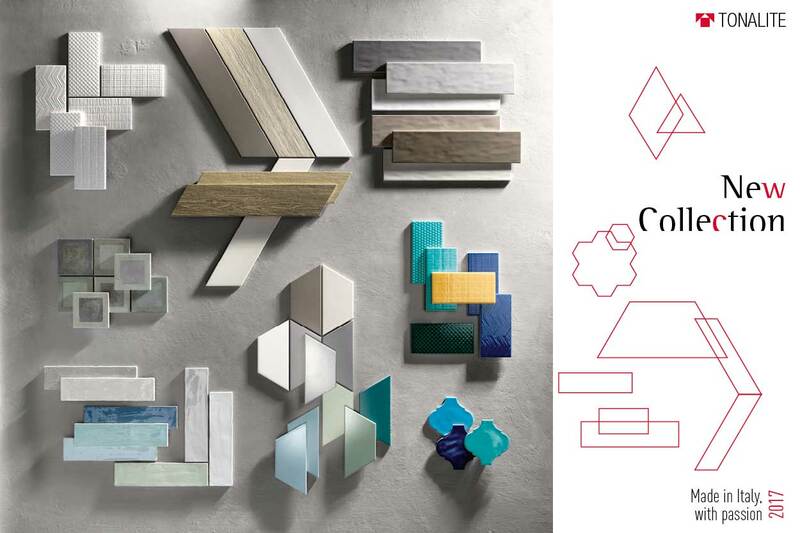 At the Cersaie 2016 exhibition you will see its lively colours and pastel shades, but also beige and pure white will find plenty of space. Side by side with the neuter nuances present in all the collections, Tonalite offers a real novelty: 10×20 size tiles in total white and with graphic reliefs. Bright shades with a craquelé effect for the new decors of the 10×20 Briolette collection: geometrical relief graphics in shades going from zafire blue to amber yellow and emerald green. After Arrow, Tonalite also shows the large sized chevron: Dart, 46×10 cms. Besides the traditional neuter tones, you will also find new colours inspired by wood. Trapez is a new shape by Tonalite. Walls and floors in a trapezoidal shape – 23 x 11,5 x 11,5 cm -, in a wide range of soft colours, with a few exceptions as Ottanio, a “sage green” tone. Crayon: a 7,5×30 double-fired tile, not rectified and available in 11 pastel colours, caracterized by irregular glossy surfaces. Amongst our new products, there is also a small (11,6×11,6) cement effect gres, with a very elegant checkered pattern.